AutoPrice Canada, member of the UCDA (Used Car Dealers Association) of Ontario. 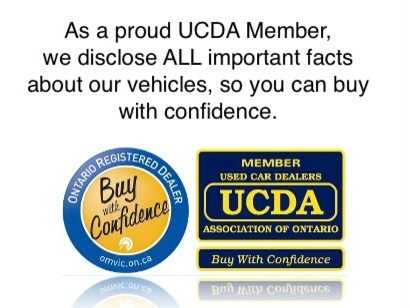 The UCDA promotes itself to the public as a mediator between Used Car Dealers and the consumer in case of a disagreement during or after the process of sale. The UCDA is able to deny, revoke or suspend the membership of any of its dealers in such situations where the UCDA finds a consistent abuse of policy, unethical or illegal behaviour of any of its member dealers. AutoPrice Canada is a member in good standing with the UCDA. AutoPrice Canada is also a member of OMVIC (Ontario Motor Vehicle Industry Council). OMVIC is a government agency representing the Government of Ontario and is mandated to enforce the legislation known as the Motor Vehicle Dealers Act. OMVIC has the ability to enforce , by law, the rules and regulations of the Motor Vehicle Dealers Act. OMVIC requires that all dealerships, salespersons and owners maintain Certification in order to do any business transactions in the automotive industry in Ontario. In order to acheive this Certification, dealers and their employees must adhere to the policies within the MVDA. This term refers to the new advertising rules set out in the new MVDA 2002 legislation. What this means is that all advertised prices must include all fees and charges related to the sale of the vehicle. It will now be illegal to "bait" a customer with one price and "switch" that bottom line price on the Contract of Sale by adding fees such as: Safety Fees, Security Fees, Processing Fees, Freight, Transportation, PDI Fees, PDE Fees, Administration Fees etc, etc…. AutoPrice Canada has done research on the potential total sum of ad-on fees and has found these fees to average approximately $700 dollars, but have been as high as $1600. With the new legislation in place, AutoPrice Canada is finally able to compete on a fair playing field. This term refers to new "Disclosure" rules set out in the new MVDA 2002 legislation. The term disclosure refers to what a dealer has to disclose during the sale process and sets out rules on how it needs to be documented. A dealer must disclose whether a vehicle was involved in a collision or incident and suffered more than $3,000.00 in damages, the consumer must know. If a (dealer) knows the amount of damage, that must also be disclosed. AutoPrice Canada has always disclosed any collision/incident regardless of the value of the damage. We have always provided Vehicle History Reports for our vehicles.